This little card was found in an old Mallorcan book. 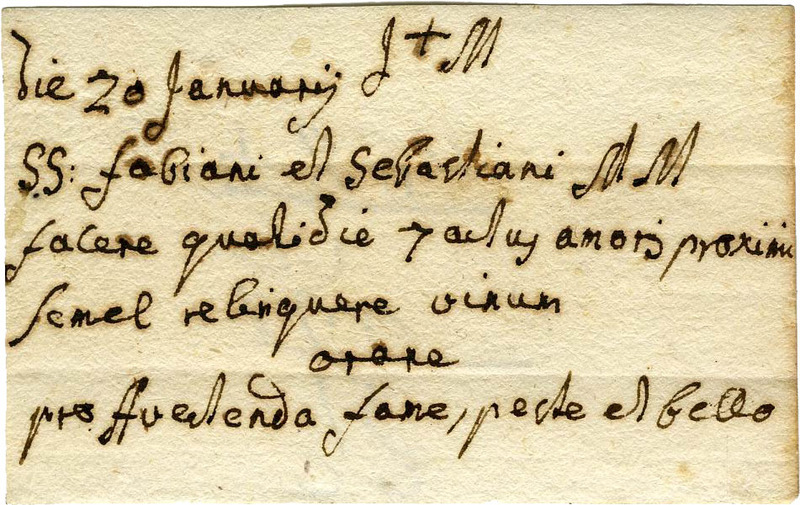 The script – based on the experiences of the publication of the Santacilia archive of Mallorca – can be dated perhaps to the 17th century. 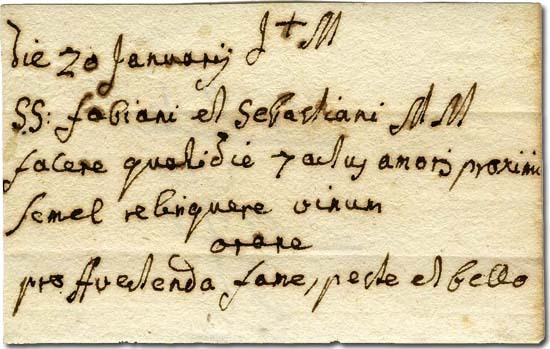 I do not know whether this card is a list of penitences given by the confessor (in some Mediterranean regions this was a custom) or a list of ascetical tasks compiled for one’s own use which two hundred and fifty years later would have been sticked with a magnet on the fridge door by the Christian striving after the more serious living up to his belief. It is probably the latter, for the practices are not very penitential, but rather festively mild if compared to the customs of the period. In fact, they do not include any fast, only the omission of wine once a day (which of course sounds a very great penitence to one who knows the majestic Mallorcan wines). The reason probably is that this day is a high feast in Mallorca, on which fast is prohibited. Saint Sebastian is the protector of Palma de Mallorca, and his feast is celebrated by three days of open fires and cooking, concerts, spectacular processions, and monumental fireworks. 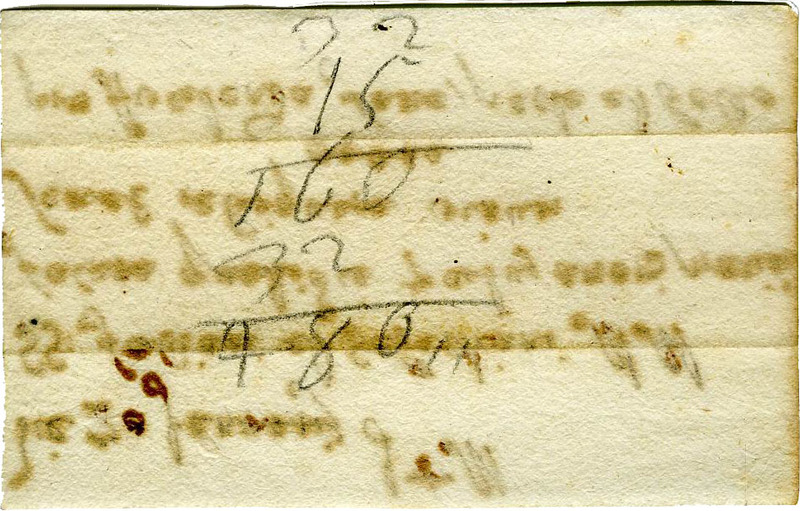 Judging from the handwriting and the tone, as well as from the book in which we have found it, the note may have been written by a 17th-century Mallorcan cleric for himself. 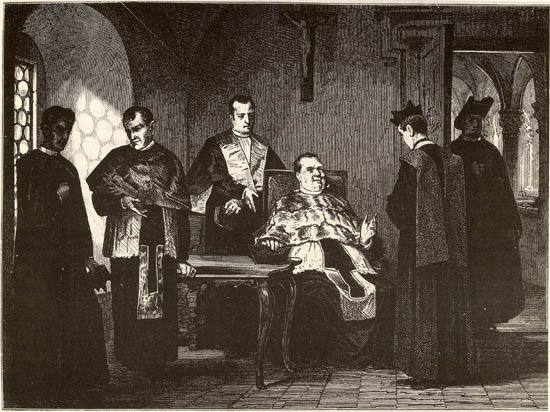 This engraving, representing contemporary Mallorcan clerics, was published in the great summary Die Balearen by Archduke Luis Salvador de Austria. The prayer refers to Saint Sebastian, too. Famine, pestilence and war, called on the basis of verses 5-6 of Psalm 91 as “tria mala Davidica,” “the three plagues of David,” were the main terrors of the age, and on the votive columns erected from the late 17th century to keep them off we always see, in the company of Saint Roche who died in pestilence, also Saint Sebastian who was killed by the very arrows mentioned in the psalm. Holy image protecting from pestilence, with the figures of the Holy Trinity, St. Mary the “Star of the Sea,” Saint Sebastian, Saint Rosalia, Saint Roche and the so-called Zachary Cross. Győr (Hungary), c. 1710. 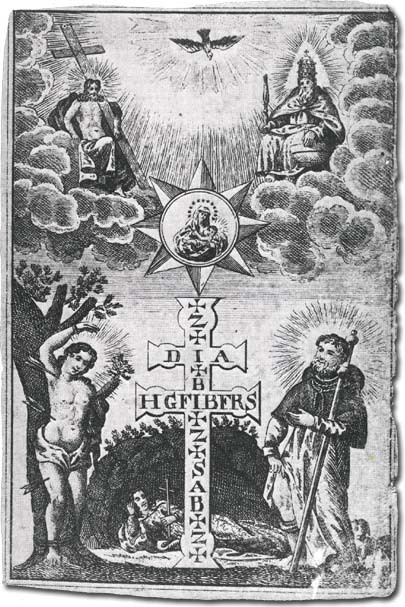 From Zoltán Szilárdfy, Barokk szentképek Magyarországon (Baroque holy images in Hungary, 1984). However, the Phoenician blood of the island was revealed even on this festive-ascetical occasion. 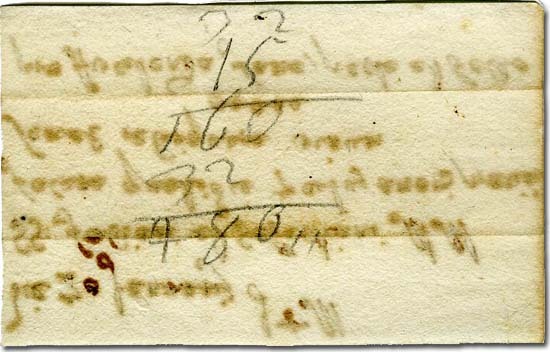 On the reverse of the card we find an addition, where – even if we do not count the script at the upper bottom which does not look like numbers – 15 is missing from the correct total of 495. On the occasion of the nearing feast of San Sebastián we hereby wish all the best, plenty of blessing, a sober quantity of asceticism and always enough wine of Binissalem to all the Phoenician merchants, Punic pirates, Balearic slingers, Jewish goldsmiths and Arabic vinegrowers of Mallorca, not forgetting either about the descendans of the Chinese sailors of Zhen He who got stuck in Sineu in 1421.